One month down. Thirty one new recipes tried (including today's). Only another 335 to go. By the end of this year, I will either be the size of a house or a gibbering wreck. Or both. In fact, I'm rocking one of those two right now. Having had a stressful day at work followed by a stressy toddler who only had eyes for Dadda this evening, I just could not be bothered to make the soup I'd planned to do. So after finally getting Miss A into bed, and having cooked the husband his Wednesday-night-without-fail tea of chicken and rice, I turned to my 100 pasta sauces book - another tome I bought when I first left home and have never used. There are so many simple recipes in there, I will probably have tried 99 of them by the end of this year. Tonight's effort was three cheese pasta. Cheese and I have a love-hate relationship. I love it, my body hates it. Well that's not strictly true, but I might as well just slap bits of stilton to my hips and backside. The year I lost five stones (when I finally went from being a full time fatty to a slimmer yo-yo dieter) I didn't eat cheese for ten whole months. And the amount of cheese in my fridge these days has a direct correlation to my mood and level of healthy activity. At the moment, the cheese shelf is groaning under the weight of stilton (tried stilton and cauliflower soup this week but it was bloody horrible and I didn't want to waste a blog on it), double gloucester, grano padano, feta, mozzarella, marscapone, BabyBel....I'm sure there's more too. But at least I had everything I needed for the recipe. Simple, cheesy, comforting and with the summery-peppery aroma of basil, it worked a treat on my mood. And a palate-cleansing chaser of fresh pineapple afterwards has washed away the general feeling of cheesy-carbs guilt. Cook the pasta according to the instructions on the packet. Drain. Melt the butter in a heavy bottomed saucepan. Add the cheeses and stir until melted. 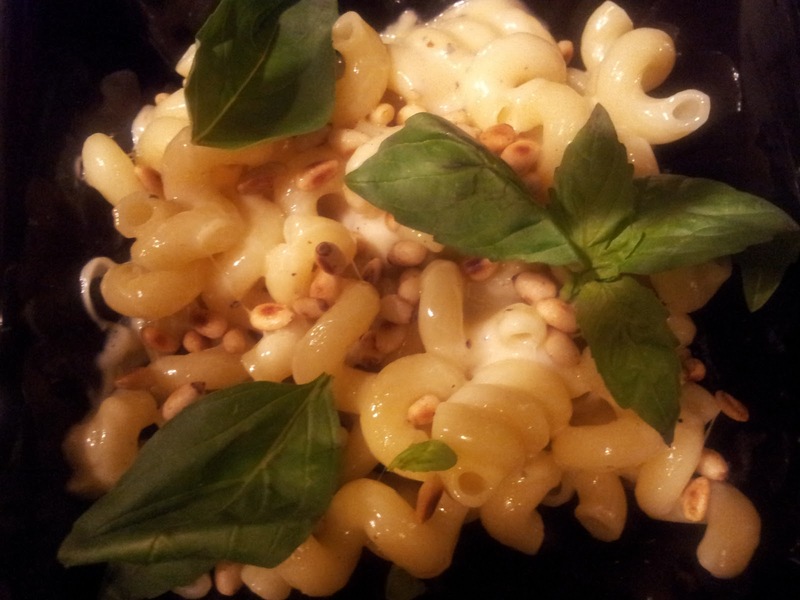 Toss the pasta in the cheese sauce, season to taste and serve sprinkled with the nuts and basil.